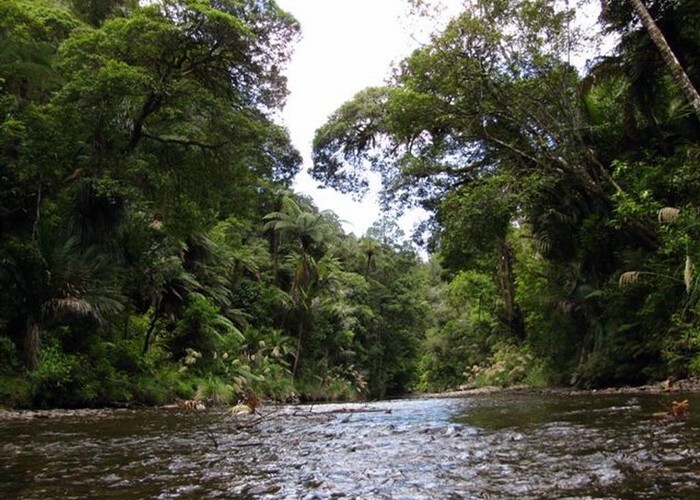 The 2 day Waipapa River Trach in Puketi Forest about 20 kms west of Kerikeri in the north of the North Island. The track takes you along the Waipapa river trough a very rich bush with lots of old big kauri trees. You can find pink flowering Manuka and white flowering Rata along the track. A part of the old track is closed but you can take a detour along the Walnut track. Half way there is a clearing called Camp Creak. A great place to stay for the night if you handle a few Possums visiting at night:-) There are lots of rivercrossings but during summer they are all easy to do. All up a great track through a patch of North Island Kauri forets of which kind there are not many left. The track can be walked from both sides either the Puketi Forest Recreation area with a campground, cabins and a hut for 16 peopls. (hut can only be booked completly). Orfrom the southern end with a basic campground called Forest Pools. Waipapa River • By flint. Added 18 January 2010 by flintflint. No revisions.